In accordance with section 26(2) of the Disability Act 2005, the CRU has appointed Access Officers to assist persons with disabilities access our services. A complaint may be made against the CRU by any person who is of the view that the CRU is not in compliance with the relevant provisions of the Disability Act, 2005. The CRU has detailed the complaints procedure, including details of how to make a complaint. 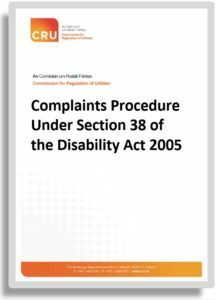 If you would like to review the procedure then open the CRU Complaints Procedure under Section 38 of the Disability Act 2005. Belgard Square North, Tallaght, Dublin 24, D24 PXW0.